Royal Blue Collection took shape thanks to an intensive collaboration with the famous Porceleyne Fles. A real honor. The beautiful hand-shaped apples vary in size from an endearing 6 centimeter to a robust 85 centimeter. There is room for this unique Dutch object in every living room, office or bedroom. The Delft blue decoration of the apple was specially designed by a master-painter of Royal Delft, entirely according to the Dutch tradition. Unique for this collection. Unique for the recipient of the gift. Or is it for yourself? The special combination of the ceramic sculptures and the painting by Royal Delft provide a special connection between a modern design and the traditional Dutch Delft blue. A maternity gift with a symbolic value. A special art object for your display case. An art object that will surprise your wife. The talented artist Caroline Hartman creates for Royal Delft the most beautiful elements on precious ceramics. Each hand-painted ceramic apple from Royal Blue Collection is a unique work of art with a rich symbolism. Royal Blue Collection is ready to customize the apple according to your specific requirements. A perfect translation. Royal Blue Collection is an initiative of interior designer and art lover Sabine Struycken. ‘Completed, as it should be’. That is the definition of perfect for Sabine Struycken. The round shape of the apple meets the philosophical idea of ​​infinity. Captured by Royal Blue Collection in excellent precious porcelain of the highest quality. 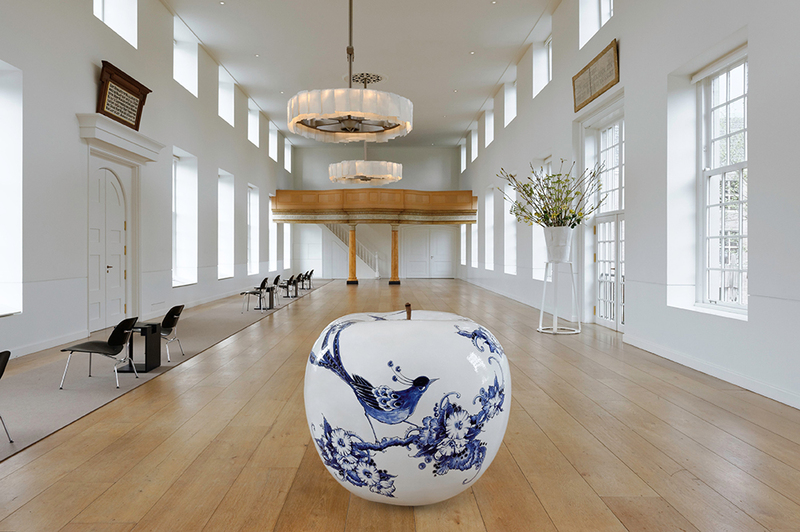 Inspired by the apple, the symbol of the earth, Royal Blue Collection creates Delft blue art objects of the highest quality. Royal Blue Collection does this in a collegial and respectful collaboration with the renowned Royal Delft. Authenticity comes from the heart. The fairytale image and the design are handmade by magnificent artists, associated with Royal Delft and inspired by Delft Blue. Delft Blue and Royal Blue Collection both strive for perfect beauty. In your interior or art collection, a unique object of Royal Blue Collection is fully at its best. The objects of Royal Blue Collections are both custom-made, exactly fitting to your interior or collection, and off the shelf. You will see this back as objects called Hand Painted and The Series. Your art collection is to be enjoyed. Royal Blue Collection consists of three lines. The Limited Edition is hand-painted line and The Series consists of four different formats. Finally contains the line Custom Made apples on request , as well as hand-painted in series with large numbers.